Aristotle Onassis was once the owner of this grand 325' mega Yacht. His daughter, Christina, along with other family members enjoyed cruising the seas in total luxury, and now, after a recent refurbishing, you to can follow the stars. Since converting this former Royal Canadian Frigate in 1954, she has hosted numerous stars, royalty, presidents, and prime ministers. The yacht was used in 1968 for the honeymoon of Mr. Onassis and Jacqueline Kennedy. The 19 luxurious staterooms will accommodate 36 guests. We are offering the holiday of a lifetime.... A one week private charter of the Christina 0 accommodating 38 people. Additionally included is transportation between the US and France on a custom Boeing 737 seating just 42 people in complete comfort and style. Limousine transportation is included. The price is One Million Dollars. *Other 11 day/10 night cruise and hotel itineraries are available between Rome and Athens ranging in price from $8,750 to $21,500 per person. Dennis Conner (winner of 4 Americas Cup races) charters his 80' racing Yacht and Americas Cup Winner in Southern California. Mr. Conner can be available for an additional fee for your catered dinner after a day of sailing with up to 48 of your friends, guests or family. Charter a legend on the East coast of the U.S.A We have access to six champion yachts. Ted Turner, and racing legend, Ted Hood, once owned and skippered two of the six former Americas Cup winners now based on the east coast of the U.S. 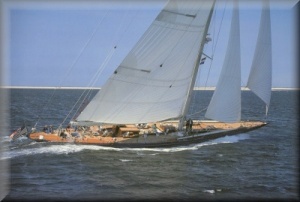 The sailing yachts can all accommodate up to twelve guests. Sir T.O.M. Sopwith pioneering airplane magnate built this renowned 130' J class Sloop in 1934. This vessel has the largest sail area in the world with over 9,000 square feet. Accommodates up to eight guests in the four magnificent staterooms. Aristotle Onassis gave Princess Grace and Prince Rainier of Monaco this elegant 147' yacht as a wedding present. Now available for sunset dinner cruises in Jamaica at a luxury first class beach front resort. beyond compare to the Caribbean, Atlantic and Mediterranean Sea. Sir Thomas Lipton well known Tea Magnate built this 120' J Class Sloop in 1930 for the 1930 America's Cup Challenge. This is the first J Class ever built. The yacht can accommodate up to 8 guests.